If you've been captivated by the pristine beaches of Panglao and the nearby islands of Balicasag and Pamilacan in Bohol, and you thought you had already seen the best of this province, then think again. If you've never been to Anda, then you haven't seen the best of Bohol yet. 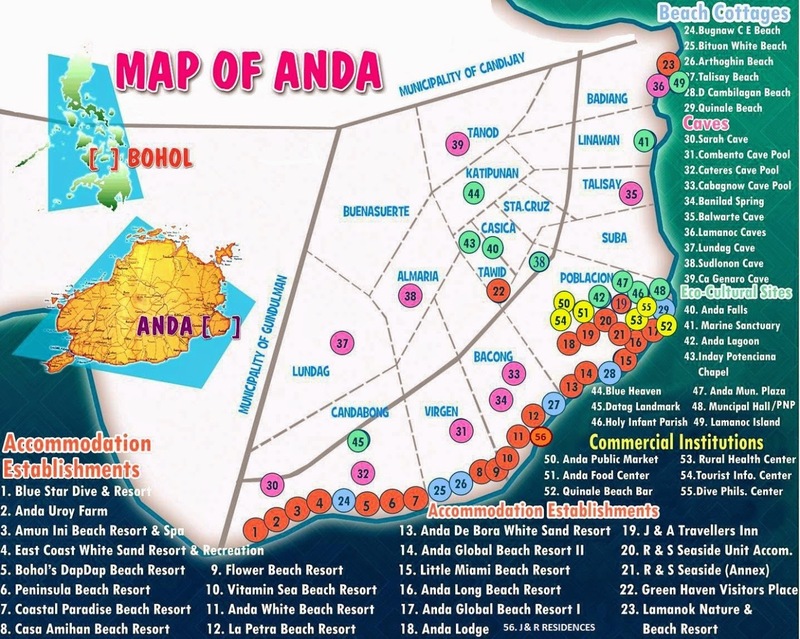 Anda is a coastal town off southeastern Bohol, facing Camiguin, Southern Leyte, and Surigao del Norte. It was formerly known as Barrio Quinale, a part of the municipality of Guindulman until it was declared an independent town in 1875. Major local airlines such as Philippine Airlines, Cebu Pacific, and AirAsia fly daily to Tagbilaran City. Travel time is about an hour. From the Tagbilaran airport, hire a tricycle to Dao Terminal. At Dao Terminal, ride a public van or bus to Anda. Travel time is about two hours and may be longer if you take the bus. Fare is Php 130. If you're riding a van, you can ask the driver to drop you off directly at the resort of your choice for an additional fee (starts at Php 20 for resorts on Quinale, which is located in Brgy. Poblacion. Add-on rates may vary). Upon arrival in Brgy. Poblacion where the powdery public beach of Quinale is, you may check out the town's tourism office near the Beach Bar. Here, you can get maps, inquire about accommodations, and book your activities for the duration of your stay. Anda hosts a variety of accommodations ranging from backpacker nooks to high-end private coves. Each resort has a niche, so make sure to do your homework. Most of the backpacker- and budget-friendly resorts are on the public beach on Quinale in Brgy. Poblacion, while most of the dive resorts are in Brgy. Candabong. If you want ultimate privacy, head to a resort on Talisay Beach in Brgy. Bacong--it's comparable to Boracay's Station 1 and Coron's Malcapuya Island back in the day. Nestled amid the expansive powdery white shores of Quinale Beach, Anda de Boracay White Sand Resort is perhaps the most popular resort on this stretch. Rooms are made of sturdy local materials, plus, it is the only resort on this side of Anda that has a pool, a spa, a gym, and a bar ad restaurant. There are fan rooms as well as big rooms perfect for big groups and families. Rates start at Php 1,500 for an air-conditioned room. Food is not a problem as its restaurant serves delectable cuisine with prices ranging from Php 70 to Php 350. Kalamay from Jagna is love! For divers and snorkeling enthusiasts, this resort is the best option. It has no wide beachfront, rather, vast colorful reefs and beautiful marine life just a few steps from the cliffside stairs. There's a small pool perfect for hot afternoons and a Jacuzzi where you can watch the sunrise. Room rates range from $75-$90. Those who are not in-house guests can still enjoy and explore the resort's reefs with its Php 500 day tour package. Php 350 is consummable on food and beverage and the remaining Php 150 serves as entrance fee. The highlights of this resort are the dive shop and the iconic Anda Dreamliner--a 65 feet long dive boat equipped with state-of-the-art naval or marine technology. The boat is complete safety gears and amenities to make your dive or snorkeling trips comfortable. There is also a kitchen and a clean comfort room onboard. Food is not a problem, too, with its signature restaurant and bar complete with a wood-fired oven that cooks delectable Italian pizzas. If you love the sea--both above and below--East Coast White Sand Resort will definitely give you the best of both. Unlike Blue Star Dive and Resort, this cliffside resort has a picturesque cove where you can just bathe in the sun after diving or snorkeling. It also has two infinity pools that command a view of the calm blue sea. The standard rooms is perfect for couples, while the family cottages are huge enough for a group of four. There's free WiFi and breakfast, too. Room rates range from Php 3,000-Php 6,500. You can also rent the entire resort as in the case of teambuildings and conferences. A group of 25 guests at a time has the option to do an "all-resort-buyout." More than 25 years in existence, this resort is no doubt the very first beachfront resort in Anda. While it is old and rustic, it still has the captivating charm and homey vibe it is known for since its humble beginnings. The wide expanse of white sand bordered by beautiful rock formations are also a plus point for this resort. Room rates range from Php 1,500-Php 4,800. Saving the best for last, this resort has the most captivating shore in Anda. Located on Talisay Beach in Brgy. Bacong, Island View Beachfront Resort boasts fine and impeccably white sands that is secluded and away from the crowd. It's a perfect honeymoon spot! What's even nice is that it has spacious rooms at affordable prices (I say affordable considering it has the best, private beachfront in town). Room rates start at Php 2,500. It has a pool, a bar, and a restaurant which serves the freshest buko (coconut) juice in the vicinity. They pick the buko from the tree right in front of the pool as soon as you order. There are hammocks where you can enjoy a nice read or just take a nap. Service also deserves two thumbs-ups! Fast, friendly, and efficient without being too intrusive. The shore is fabulous! We had it all to ourselves! The bathroom is spacious, too! Anda boasts a number of coves and beaches that are lined with resorts of all sorts--from budget to luxurious. 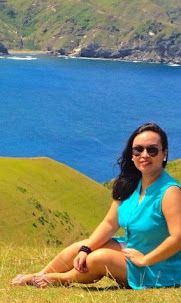 Among them are Quinale Beach, Dapdap Beach, Flower Beach, and Talisay Beach. Of these beaches, I find Talisay the most outstanding for its fine white sand and laid-back vibe. Quinale Beach on the other hand is a public beach that is a famous for camping and day tour. Entrance fee is Php 10. During our trip in Anda, we were able to see three cave pools along the way. The first one was the Cateres cave pool, which is located near Bohol's Dapdap Beach Resort. The water is clear and blue, but it may be hard to get in and out of the cave pool as it doesn't have a ladder and the rocks around it are steep and sharp. Next was the Combento cave, a shallow cave off Brgy. Virgen--the barangay between Candabong and Bacong. This one is easier to access as there are stair-like rocks you can step onto. The water is crystal clear and inviting. Lastly, we all went to Cabagnow cave pool in Brgy. Bacong. Of the three, this is the biggest and most dangerous to get into, but it is also the most stunning. The water here can go up to 25 feet, and from where we stood we could already see its bottom teeming with fish and rocks. You can freedive and snorkel here but be prepared for a challenging exit. This is it! Cabagnow for the win!! I was surprised when Juvie, the tourism officer who toured us around said that the replica of the Black Nazarene that is usually used at the annual procession in Quiapo is now housed in Sto. Nino Church in Brgy. Poblacion. I got goosebumps when I learned about this as I am a big devotee of the Black Nazarene. I was able to see him up close and touch his image. A shrine is being built beside the old church for the Black Nazarene. You can also check out Lamanok Island and its beach, mangroves, and caves with prehistoric hematite graffiti art. If you are just having a day tour at Quinale Beach, you need not worry about getting hungry as the local government unit manages the Beach Bar, a restaurant and bar right on the public beach. You can order a la carte (price starts at Php 110) or you can ask them to prepare a group meal perfect for sharing with friends and family. You can also rent tables, chairs and tents (for dining) for a minimal fee.